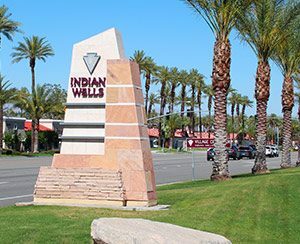 The City of Indian Wells is a resort community located in the Coachella Valley. This small city packs a ton of events, resorts and amenities into its borders. With one of the best municipal golf courses and host to the 6th largest tennis tournament in the world this community has become a world-renowned destination for tourists and sports enthusiasts alike. The instant you enter the palm tree lined streets of Indian Wells it becomes apparent why this small city attracts luxury home buyers and huge high-end resorts because of the beauty and opulence of this very pretty city. While homes in Indian Wells often fetch a high price, these prices can easily be justified with the quality of home, amenities and access this city provides their residents. Desert Horizons CC is a family centered community featuring a beautiful Ted Robinson designed course kept to pristine condition. This beautiful, centrally located, country club offers single-family homes, condos and townhouses for resale. Eldorado Country Club is a premier member-owned club in Indian Wells, California with a rich history dating back to 1957. This picturesque cove at the base of the Santa Rosa Mountains, gives this rich social life behind its gates an ideal backdrop for golf, social and athletic activities. Membership at Eldorado Country Club is by invitation only. Eldorado’s transcendent qualities forge unique relationships through generations of families, and has members from former US Presidents to many famous personalities. This pretty litlle condo development has its own simple par-3 golf course with a lake and a stream. Toscana Country Club offers the perfect blend between luxury and fun. Different membership options for both golf and sport is available to new prospective members. This beautiful Country Club is home to luxurious Tuscan style homes with beautiful views of the Coachella Valley and its surrounds. Home prices start at $1,300,000 and are all in excess of 2,400 square feet in size. The Vintage Country Club sits atop the pinnacle of luxurious desert living. This illustrious club is home to titans of industry and tech with spectacular homes beyond comparison. Didn’t find the community your were looking for? Contact one of our highly knowledgable real estate agents who can help you right away – here.